We have developed specific lines of quality student instruments with several makers in Germany, the Czech Republic and Romania. Our brand names are proprietary and are carried only in our stores. These instruments come in sizes from 1/32 to 4/4. They offer outstanding workmanship and sound at affordable prices, the best available value for student instruments of this exceptional quality. For advanced students and professionals, we are importing new "maestro" instruments from Italy, France, Germany and Romania. Some of the makers are: Karl Stamitz - Peter Heffler - loan Luca - Roman Boianciuc - Luce Sebastian. We are the exclusive East Coast dealer in the U.S.A. for Raffaello di Biagio instruments. These exceptional violins, violas and cellos are made in Cremona, Italy by this internationally acclaimed luthier who is considered one of the most gifted Italian violinmaker of the modern generation. 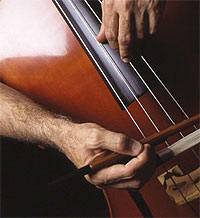 We also carry 5 string basses made by various makers. Some fine bows are made specifically for Constantin.